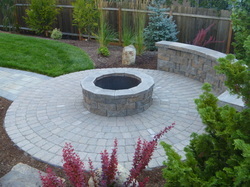 Graham Landscape and Design LLC designs, installs, and maintains residential and commercial landscapes in Veneta Oregon. Pictured to the right is a complete backyard landscape in Veneta Oregon designed and installed by Graham Landscape and Design LLC. The Problem: This homeowner in Veneta Oregon had a blank slate of a backyard that needed some interest and additional outdoor living space. 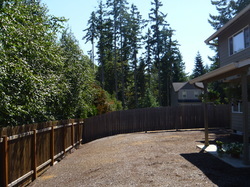 The landscape consisted of a small concrete patio that the builders installed with the house and a lot of bark-o-mulch. This landscape in Veneta Oregon also lacked enough privacy between the houses. Our customer wanted to be able to feel like they were in their own yard and enjoy it with their friends and family. Privacy concerns were very important in this landscape, but it also needed more interest for them and for future upside value to their home. These homeowners decided to hire Graham Landscape and Design LLC, a professional landscape design build company, to draw up plans and install a landscape to match the scale of their new home. The Solution: Graham Landscape and Design LLC created a multi-faceted landscape design to complement their beautiful new home. The outdoor fire pit, seat wall and paver patio and evergreen privacy planting were just what these homeowners were looking for in their smaller scale landscape. While the neighbors had a nice stand of Birch trees for summer privacy, winter time and the drop of leaves from these deciduous trees brought views from kitchen window of one home to the kitchen window of another, not to mention other views to other rooms in the homes. Graham Landscape and Design LLC designed a conifer planting and brought in medium sized conifer trees to fit our client's budget. We selected species that will grow relatively quickly so that in a couple of seasons, the homeowners will be able to enjoy privacy afforded to them by the landscape. We chose species such as the Hinoki Cypress, Dwarf Evergreen Magnolia, Colorado Blue Spruce, and a hybrid variety of Western Red Cedar. 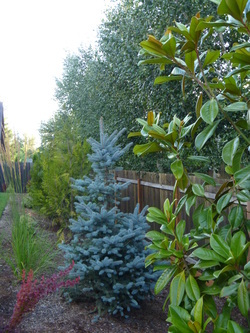 Graham Landscape and Design LLC is a firm believer that not every evergreen privacy hedge has to consist of Emerald Green Arbovitae or Leyland Cypress. Privacy plantings can have interest, depth, color, texture, and varying heights. 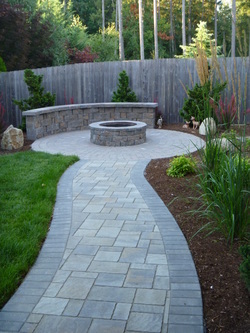 The paver walkway leading to a circular paver patio and stone firepit with seating wall created a separate "room" for this landscape. A fair amount of interest and function can be had in a smaller landscape with the right design and materials. Seat walls serve as a great visual stop for the eye, but also function well as patio furniture. By using seat walls, smaller patios need less seating and therefore feel larger. 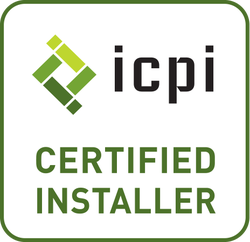 These homeowners in Veneta Oregon had peace of mind knowing that their hardscapes were installed by an ICPI (Interlocking Concrete Paver Institute) certified installer. Low-voltage lighting installed by Graham Landscape and Design LLC in this Veneta Oregon landscape completed the finishing touches. We designed and installed wall lights for under the seat wall cap to add landscape interest well into the night. The end result of the landscape design created by Graham Landscape and Design LLC is the finished product these homeowners love to come home to. The automatic sprinkler system in Veneta Oregon, also installed by Graham Landscape and Design LLC, makes landscape maintenance easy. Going away on vacation is a lot more peaceful when you can rest-assured knowing your landscape will receive the right amount of water and not having to rely on your neighbor to perform the daily hand watering responsibilities.